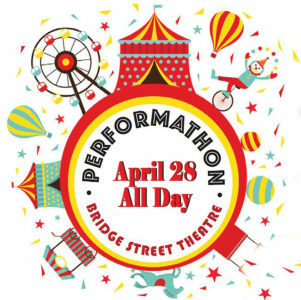 CALL FOR PERFORMERS FOR BRIDGE STREET THEATRE’S PERFORMATHON! Now’s your chance to grab the spotlight! Catskill’s Bridge Street Theatre is currently on a search for performers of all types: professional musicians and recorder players; opera singers and shower soloists; Shakespearean soliloquists, class clowns, and anyone who enjoys commanding attention at family gatherings with their thinly-veiled stand-up routines. Whatever secret (or not-so-secret) talent you have, BST wants to put you front and center, sharing it with the world during its 2nd Annual Performathon Fundraiser on Saturday April 28 from 10am to 6pm. So haul out those tap shoes, dust off that accordion, pull those poems out of the drawer, and sign up for a performance slot today. A small donation of $1.00 per minute of stage time (with a 5-minute minimum and a 15-minute maximum) is required and, should you wish to help support the theatre even more, why not gather sponsors to donate an additional dollar for every minute you’re performing? Contact Kelly Thompson at [email protected] and she’ll get you all set up. BST’s Performathon is not only a way for you to express your inner creative spirit, but also a way to support this amazing cultural resource here in Catskill. Bridge Street needs you and your hidden talents to make this a day full of fun for everybody. Help ensure that you’ll be able to keep enjoying live, local theatrical performances and keep our entire community thriving and growing. The Performathon is guaranteed to be a rip-roaring good time! For further details, visit the theatre’s website at bridgest.org. Come strut your stuff on our stage!